A couple of weeks ago I received a rather exciting invitation from Dewar’s Blended Scotch Whisky. Usually, these things take the form of a pdf attached to an email, or at best, a card in the post. Rarely do I have to scribble on a courier’s useless handheld machine in order to simply receive an invitation to an event, but this was no run-of-the-mill drinks reception and canapés. 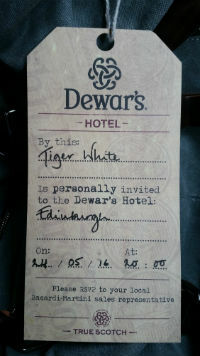 The invitation, a large traveller’s canvas bag, was traded in exchange for entry to the Dewar’s Hotel, held at Hotel Du Vin in Edinburgh. The evening started with a delicious cocktail conjured up by Dewar’s Dark Spirit Ambassador, Jamie Mac, and Kyle Jamieson from the iconic Devil’s Advocate bar in Edinburgh. From there, we were led through the hotel to a blind tasting of Dewar’s 12yo versus a leading industry competitor (thankfully I chose the ‘right’ whisky!) before heading to a wonderful recreation of the Dewar’s blending room. 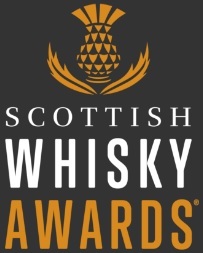 The importance of the Dewar’s family to the blended whisky industry cannot be underestimated. Founded in Perth in 1846 by John Dewar, the Dewar’s brand grew and grew and, with the inimitable Tommy Dewar (one of John’s sons) travelling the world extolling the virtues of Dewar’s Blended Whisky, the business became so successful the family decided they needed their own distillery. Cue the founding of Aberfeldy distillery, located just a few miles from John’s birthplace. The key role of Dewar’s in the history of blended whisky, and the skill and expertise of the master blender we brought together in the blending room where we created our own blends. 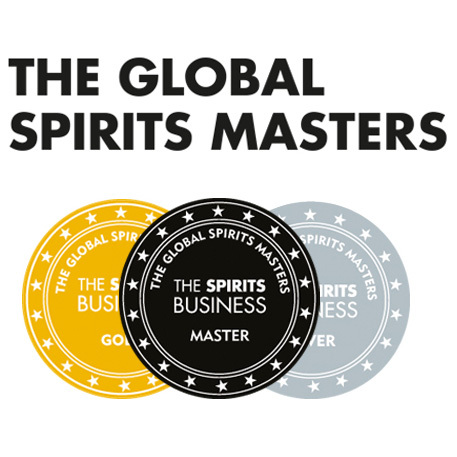 After having successfully created the world’s next world beating blend (!) we were then whisked back to the hotel lounge for more cocktails, journeying from classic hi ball drinks to modern day classics; Blood and Sand and Ice, to the tea-infused ‘The Rambler’ to the Penicillin. After picking up our now goody-filled canvas bags we headed into the cool Edinburgh night air. All in all, a fantastic night. 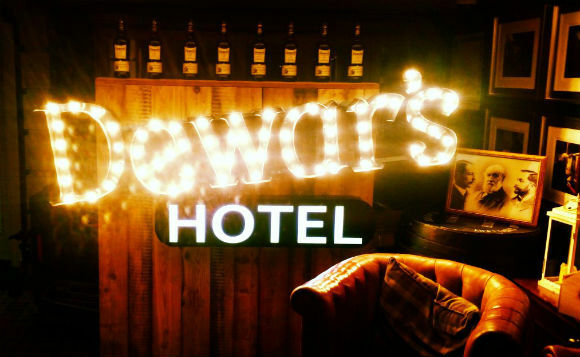 If you’d like to be part of the Dewar’s Hotel experience, keep an eye out as the travelling hotel will pop up in 9 cities across northern Europe over the summer. You won’t look at blends the same again. This entry was posted	on Friday, June 10th, 2016 at 2:28 pm	and is filed under Events. You can follow any responses to this entry through the RSS 2.0 feed. Responses are currently closed, but you can trackback from your own site.